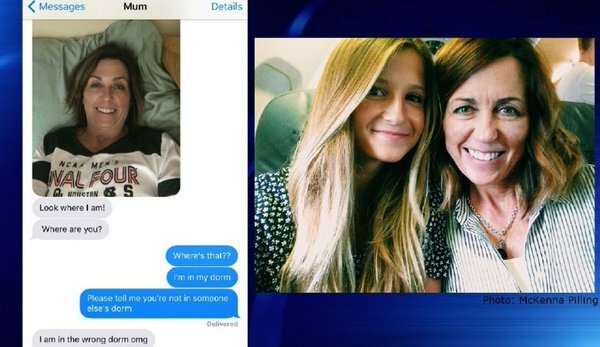 Mom goes to surprise her daughter at college, sneaks into wrong dorm room and takes a selfie in a strangers bed. Deanna Pilling, is at Utah State University to pick up daughter McKenna. A Big Apple mom tried to surprise her daughter at college by sneaking into her dorm, but wound up breaking into the wrong room and snapping a selfie on a stranger’s bed — completely mortifying her millennial offspring. Deanna Pilling traveled from her Morningside Heights apartment to Utah State University last week to pick up 18-year-old McKenna, who had just completed her first year at the school. Bakersfield, California, police cars crash into each other. One officer did not see the other 3 had stopped at a red light. Asian girl tries to eat corn on the cob while on a drill and gets her hair and part of her scalp pulled off her head. Former NBA player Gilbert Arenas admits to credit card fraud and then brags about it on Instagram. What a guy! !